MILLGROVE, Ont. (July 11, 2015) – TJ Marshall (No.15 Sweers Custom Painting) took the lead on lap two and held off a pair of challengers over the final 25 laps of the main event to earn his first win of the 2015 season with the Lucas Oil Canadian Vintage Modifieds at Flamboro Speedway on July 11. Rich Schurr (No.36 Challenger Valve) and Cassidy March (No.08 H&M Auto) brought the field to the green flag for the main event in round five of the 2015 season. The field fought to get to the bottom lane at the tight 1/3-mile oval in the opening lap, but Marshall and Steve Trendell (No.57 Combined Auto & Truck Repair) stuck to the outside lane. A clear path on the outside allowed Marshall to take over the point with Trendell in tow. Jason Keen (No.18 Oakville Auto & Diesel Machine Shop) followed Trendell’s No.57 in to third and the top-three set sail on the rest of the field, leading by a full straightaway until a lap 10 caution slowed the field as Jeremy Riopelle (No.88 Young Drivers) got turned around in turn four. Keen jumped in to second on the restart when Trendell couldn’t get the car glued to the bottom lane in turn four. Marshall led the next 10 circuits until he second and final yellow flag flew for Richard Strange’s No.09, which rolled to a stop on the frontstretch. Neither Keen or Trendell could solve a very quick Marshall on the restart, who earned his first win of the 2015 campaign. Keen Trendell, Brian Atkinson (No.92 Performance Plus Auto) and Ben Charbonneau (No.2 Steve Scherer Chevrolet) completed the top-five. Two qualifying heats set the stage earlier in the night with 13 cars attempting to earn the pole for the 25-lap main event. Before Jason Bowden (No.00 Oakville Trailers & Auto Service) could turn a lap in heat race action, the power plant expired on his 1935 Ford Coach. Schurr and Rick Jones (No.99 Jones Racing) brought the field to the green in heat one, but the third-place starting Charbonneau quickly grabbed the lead. The No.2 car earned the heat win despite Keen’s efforts to take over the point. March and Marshall paced the field at the start of heat two. Marshall used his front row starting position to gain an early advantage and never relinquished the top spot. Trendell did his best to overcome Marshall’s advantage, but fell just short despite being within a car length of the No.15. 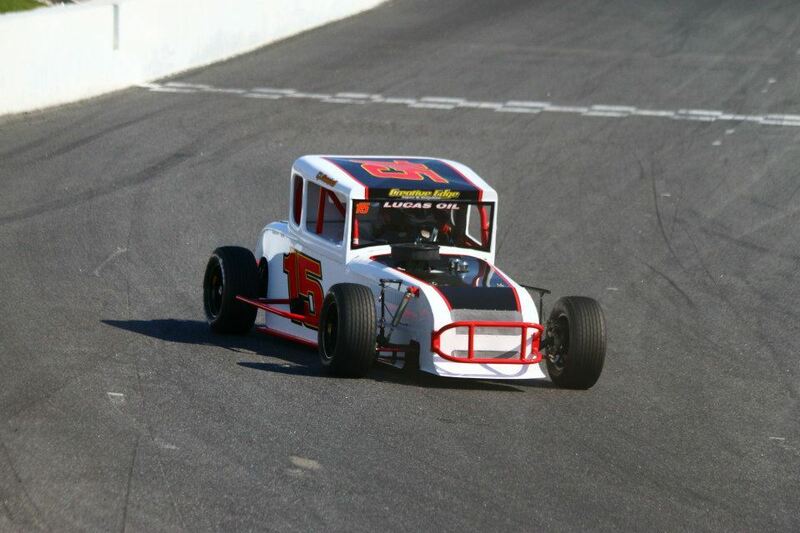 The series shifts gears to the high-banked 1/3-mile at Sunset Speedway for round six. Keen won the series’ last visit to the Stroud, Ont. oval on May 23. Racing is scheduled for 6:00pm with spectator gates opening at 3:30pm. Feature (25 Laps – 12 Starters): 1. 15 TJ Marshall, 2. 18 Jason Keen, 3. 57 Steve Trendell, 4. 92 Brian Atkinson, 5. 2 Ben Charbonneau, 6. 08 Cassidy March, 7. 88 Jeremy Riopelle, 8. 38 Dustin Hood, 9. 99 Rick Jones, 10. 36 Rich Schurr, 11. 29 Daryl Henwood, 12. 09 Richard Strange, 13. 00 Jason Bowden (DNS). Heat 2 (10 Laps): 1. 15 TJ Marshall, 2. 57 Steve Trendell, 3. 88 Jeremy Riopelle, 4. 29 Daryl Henwood, 5. 09 Richard Strange, 6. 08 Cassidy March. Follow the Canadian Vintage Modifieds 2015 season on social media by following @VintageMods on Twitter and joining the series Facebook group, Lucas Oil Canadian Vintage Modifieds. The Lucas Oil Canadian Vintage Modifieds 2015 season is presented by a number of important corporate partners, including: Lucas Oil, Creative Edge Signs and Graphics, B&B Decals, Flamboro Machine Shop, Wiersma Trucking, Young Drives of Canada, Georgetown Printing, MacMaster Buick GMC, Oakville Trailer & Auto Service, Oakville Auto and Diesel Machine Shop, Grisdale Racing Products, OKTANE Productions, and Clayton Johns Media.